This exhibit is a project of the Jewish Art Salon. Exhibit on view till June 11, 2012. By appointment only. Email Rachmanskya@ujafedny.org for access. Richard McBee and Joel Silverstein, Curators, Jewish Art Salon. Siona Benjamin, Chava Evans, David K. Friedman, Tobi Kahn, Robert Kirschbaum, Batya F. Kuncman, Howard Lerner, Judith Margolis, Richard McBee, Jacob Mizrahi, Eden Morris, Ellen Deitell Newman, Natan Nuchi, Archie Rand, Cynthia Beth Rubin, Debbie Schore, Janet Shafner, Adele Shtern, Joel Silverstein, Renata Stein, Elke Reva Sudin, Deborah Ugoretz, Yona Verwer, David Wander, Ahron D. Weiner. Painted around 245 C.E., the Dura Europos synagogue murals illustrate a series of popular Torah narratives and are among the earliest attempts to depict literary biblical stories through visual form. 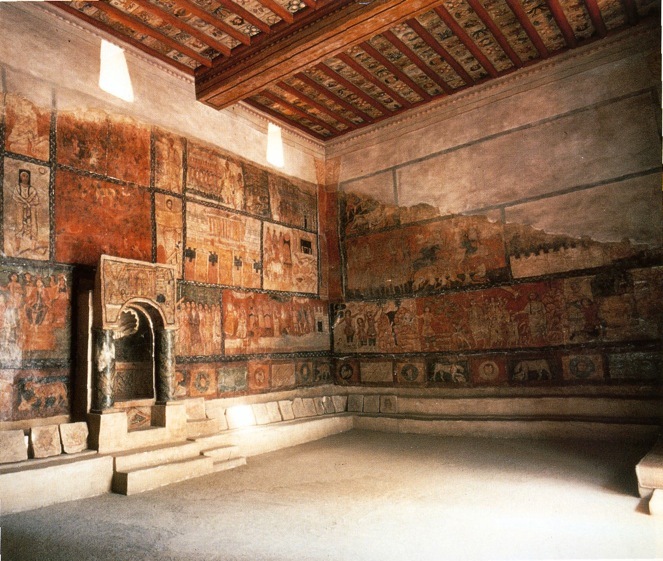 Destroyed by the Persians in 256 C.E., the Roman town of Dura, on the edge of the Euphrates River, was forgotten until the British accidentally uncovered it in 1920. The murals, which now hang in the National Museum of Damascus in Syria, became the inspiration for an exhibition conceived by the Jewish Art Salon, which invited its members to create their own interpretation based on the subjects and concepts found in the ancient murals. In making contact with art from more than 1,700 years ago, the result was a modern commentary, expressing a contemporary perspective with the past as its muse. 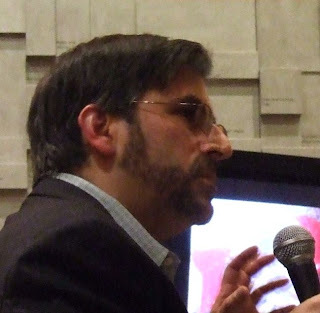 Curators: Richard McBee and Joel Silverstein. First shown at Philadelphia Museum of Jewish Art in 2010, this exhibit features a curated selection from the Philadelphia show, organized by Wendi Furman and the Jewish Art Salon. "Dura Europos, a Greco-Roman synagogue from the mid-third century CE is currently in modern Syria. When the synagogue was discovered, this building was found to hold the finest collection of biblical murals ever executed in the ancient world. The murals represent a true beginning for 'Jewish Art,' one reflective of its audiences' beliefs, hopes and fears. There are approximately 23 artists in the exhibition. Each artist was required to execute a 30" x 30" panel in any medium with an image or subject from Dura in mind. When assembled, these paintings will comprise a contemporary environment of religious and cultural ideas within the Jewish community. We look back to Dura to see images of ourselves." "Dura Considered" by co-curator Richard McBee on the ancient Dura Europos. (First published in the Jewish Press). The dilemma of the Jewish artist is that he or she is often dismissed out of hand as a cultural and halachic impossibility. And yet a very real history exists to reveal a great many antecedents. Jews have made Jewish art for at least two thousand years; 20th & 19th century paintings, five hundred years of making ritual objects and illustrated prayer books, haggadahs, megillas and ketubos not to mention the extensive production of illuminated manuscripts between 1300 and 1500. And in the Land of Israel at least 18 decorative mosaic synagogue floors spanning the 4th through 6thcenturies of the Common Era have been uncover so far. Where did it all begin? The answer is simple: Dura Europos. “Aladen’s Lamp had been rubbed and suddenly from the dry, brown, bare desert had appeared paintings, not just one nor a panel nor a wall but a whole building of scene after scene, all drawn from the Old Testament in ways never dreamed of before"; exclaimed Clark Hopkins, one of the first archeologists to see the newly discovered frescoes from the synagogue at Dura Europos in 1932. In that one exciting location there are no less than 14 major narratives depicted on the walls of the synagogue. They are not symbolic ciphers, rather they are fleshed out scenes that evoke in a complex and often midrashic style well known Torah narratives. They had been painted for this synagogue sometime around 245 CE in the frontier Roman town of Dura. The town was overrun and destroyed by the Persians in 256 CE and forgotten until the British accidentally uncovered it in 1920. 2) Sequential Narrative (or conflated narrative); in the panels of Exodus, Finding Moses, Elijah on Mount Carmel, Elijah Resuscitates the Widow’s Child, Triumph of Mordechai, Ezekiel and the Valley of the Dry Bones. 3) Comparative Narratives; The Well sustains the Camp in the Wilderness, Consecration of the Tabernacle (?) as opposed to the Temple of Dagon (?) and the Ark in the Temple of Dagon. While a number of the identifications are subject to scholarly debate and no mutually agreed overall narrative program has been agreed upon after close to 80 years of study and debate, there is a consensus that the panels are obviously not chronological, nor simply illustrational. There are simply too many idiosyncratic and/or midrashic visual elements to read the images literally. Most scholars maintain there is some underlying ideological and didactic program. Some of the opinions of the narrative program include R. Mesnil du Buisson (1939), discerns historical, liturgical and didactical themes corresponding to the three primary wall registers; A. Grabar (1941), sees the frescos as a running commentary on official Roman art; R, Wischnitzer (1948), interprets the images as expressing a hopeful messianic theme; Erwin R. Goodenough (1953): perceives Dura as a non-rabbinic mystical cult; Carl Kraeling (1956) sees expressions of heterodox beliefs, ignoring normative injunctions against images; J. Gutmann (1972), posits the celebration of the new liturgy that substituted for the Temple sacrifices; Gabrielle Sed-Rajna (1995) reads the hope of collective redemption in affirmation of the covenant and Jas Elsner (2001) sees in the frescos an aggressive commentary on the surrounding pagan religions. This is just a sampling of scholarly opinion concerning the meaning of the Dura frescos. This wide body of informed conjecture on the painting’s meanings amply highlights the rich diversity of subjects the Jewish community at Dura chose. For our purposes a simple description of the primary narratives will help orient us to this difficult but inspiring masterpiece of Jewish Art. The western wall is the most complete with at least 12 large narrative panels visible. 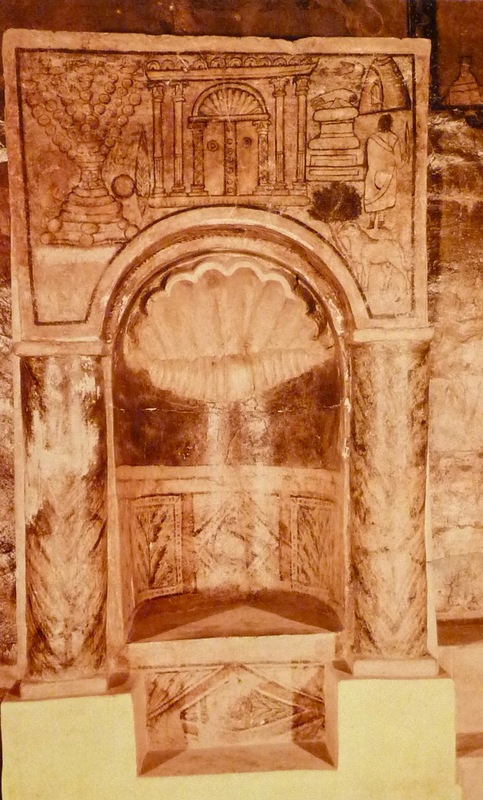 In the center is the Torah niche surmounted by the large panels of subjects that may represent Jacob Blessing his Sons and the Messiah (according to Goodenough). Clearly an important central image, it is simply too damaged due to numerous repaintings to comment on intelligently. This central panel is framed by four standing male figures each clad in a Greek (i.e. Roman) robe (chiton) with a cloak (himaton) draped over it and sandals. Their poses are typical of Eastern Roman Art of late antiquity; fully facing the viewer, weight of the body on one foot in profile, the other foot slightly forward. They all sport short Greek-style beards. One clearly represents Moses at the Burning Bush while the others may represent Moses ascending the mountain, Abraham at the Covenant and Joshua with a Torah scroll. The importance of these images cannot be overstated. 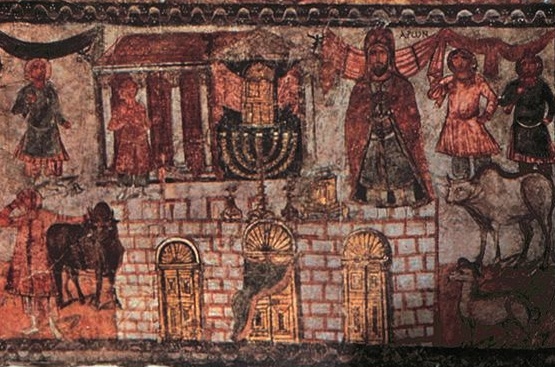 As one of the earliest sections of the Dura paintings it is also the prototype for all Jewish synagogue decoration for at least the next 300 years. Secondly it boldly substitutes a pictorial narrative (the Akeida) for a symbol (the shofar), brazenly thrusting Jewish religious expression into the visual realm, utilizing the means of the surrounding culture to concretize our faith and claims on God’s mercy. The fact that these images also integrates Sarah’s role in the Akeida is all the more startling since in subsequent representations she is almost never depicted. So if indeed this is “beginning of Jewish Art” some pointed questions must be asked. Considering the complexity of images and sophistication of organization of the entire cycle, all the scholars believe that this artwork must have had antecedents. What were the models? Could there have been a Jewish tradition of manuscript illumination, now totally lost, that depicted similar narrative cycles? Or does the style of the paintings derive form the extensive visual traditions of surrounding pagan cultures, Roman, Persian and Syrian? 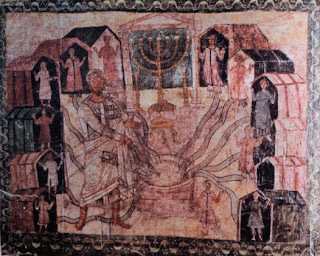 The longer we study the Dura Synagogue murals the deeper the mystery becomes. Admittedly the images we have are frequently hard to see and, when clear, primitive and foreign. Nonetheless, this unknown artist or artists and the community that commissioned them utilized Torah narratives as a means to comment on the complexity and hopes of their community, a small ethnic minority in a polytheistic Roman border town. The notion of consummate outsiders struggling to forge culture and identity surely resonates with the modern Diaspora Jewish artist. 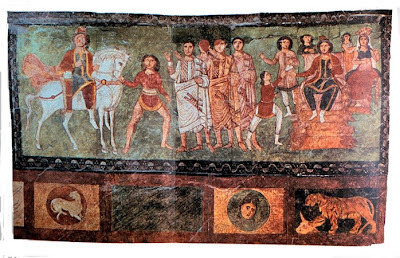 Dura Europos looms large in the history of Jewish Art not only because of its place as the earliest example of Jewish Art but also because its achievements are seemingly at odds with the conceptual and halachic problems it presents. The complexity and variety of Torah subjects depicted are more ambitious and extensive than any Jewish Art until the advent of the illuminated Haggadahs in Spain one thousand years later. The notion of a synagogue interior fully decorated with images does not reappear until the famous painted shuls of Poland, Lithuania and Russia in the 17th century. All that said, the images we see are at times problematic. Aside from the fact that the extensive figuration, especially on the Western wall toward which congregants would pray, flies in the face of the injunction against graven images in the context of worship, other issues arise upon closer inspection, many of the Torah figures, Abraham, Moses, Samuel and Elijah are depicted in Roman costume as contemporary statesmen-heroes, blurring the distinction between Jew and Gentile. 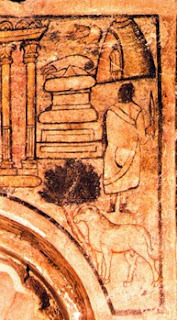 There are troubling factual inconsistencies: the last two sections of the Exodus panel are out of narrative sequence; the consecration of the ‘Temple of Aaron’seems to show a bull about to be killed with an ax contrary to normative Jewish slaughter and the panel frequently labeled as ‘Solomon’s Temple’ shows the Temple doors decorated with recognizable pagan figures. Finally the panel Rescuing Moses from the Nile depicts Pharaoh’s daughter as unclothed. Nonetheless, these contradictions to our notions of appropriate synagogue decoration must not distract us from attempting to understand the earliest example of Jewish narrative art. We have seen many instances of Jewish Art borrowing non-Jewish motifs for Jewish theological purposes. The use of the Zodiac as a representation of God’s control of the natural world through his celestial agents in ancient synagogue mosaic floors, combined with figurative personification of the seasons and the inclusion of Helios, the sun god riding a chariot, was a common motif in the Jewish late antique visual lexicon. We have also seen this motif throughout Eastern European synagogues and even in the contemporary Bialystoker Shul on the Lower East Side. The figure of Moses, seen at least eight times, is the most frequently depicted individual in the Dura paintings. Exodus dominates the upper right register of the Western wall and reads right to left. The giant figure of Moses, his staff raised high, is leading the well-organized and armed Israelites. Behind them are the open gates of Egypt that show three winged deities above the doors, representing the paganism left behind. Next, moving to the left, is a flat aerial view of the sea filled with the drowned Egyptians. Moses appears again at the left edge of this sea, his staff stretched out over the waters. Finally Moses is seen yet again, his staff touching the sea filled with fish that has parted for the Israelite army marching along 12 clearly defined lanes. Twice along the very top of the panel the “Hand of God” is seen directing the miraculous events. The depiction of an armed Israelite Exodus going through the sea along 12 lanes indicates the artist’s familiarity with midrashim that indeed date from this period. The Exoduspanel, comprising three episodes that feature a boldly heroic Moses working in tandem with an invisible God, is one of the most triumphant images imaginable of Jewish victory over pagan oppressors. Many of the Dura stories, including Exodus, are depicted using Continuous Narrative (mentioned as ‘Sequential Narrative’ in Part I (Jewish Press - June 25); a technique in which the action unfolds in one continuous visual field, depicting the same characters repeatedly as events develop, thereby conflating time and space. Trajan’s Column in Rome depicts the events of the Dacian Wars in one continuous strip winding from bottom to top of the 98’ column. Completed around 131 CE, it is a well-known example of Continuous Narrative. Directly below the Exodus panel but separated by the middle register, is the extensive depiction ofRescuing Moses. This also narrates from right to left in three distinct scenes; starting with Pharaoh ordering the midwives to kill the Jewish male infants. Progressing to the left side of the panel we see the infant Moses twice; once being held by Pharaoh’s daughter(?) in the water that flows along the entire length of the scene and then held by two women, presumably Miriam and Jocheved. They are dressed identically to the midwives and probably reflect the midrash (Shemos Rabba 1:16) that identify the midwives as in fact Miriam and Jocheved. In its subtle way this panel is emblematic of the Dura narratives. The artist felt free to interpret the text to suit his immediate needs. Aside from the generous use of midrashic material, he shows the Triumph of Mordechai as if it were the climax of the story that saved the Jews. Of course it is no such thing, rather it is a fleeting victory against the determined Haman who is only defeated when Esther the next day courageously denounces him to Ahasuerus. Nonetheless the artist was determined to depict the triumph of the Jews under God’s providence using the tools of easily understood contemporary Roman and Syrian visual motifs. 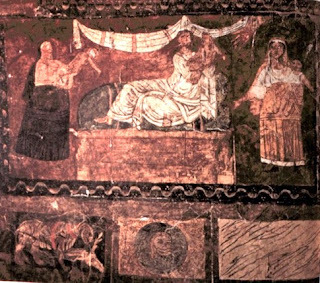 Our examination of the Dura Europos murals has yielded important insights into early Jewish Art. We saw how the Torah niche images of the Menorah, Temple and Binding of Isaac utilized both symbolic and narrative representations to create meaning (Part I). We examined three complex examples of Continuous Narratives, Exodus, Rescuing Moses and theTriumph of Mordechai. Exodus boldly proclaimed Jewish triumph over Egyptian oppression, Rescuing Moses depicted the salvation of the infant Moses by the hands of an Egyptian princess and finally theTriumph of Mordechai posited the victory of the Jewish people in the guise of an imperial celebration. All of the above was accomplished by freely combining Biblical and midrashic references and exploiting an eclectic assortment of non-Jewish visual sources. In Part III we will explore the resurrection narratives of Ezekiel and Elijah along with a theory of how two broad Comparative Narratives form a scathing criticism of surrounding pagan religion. 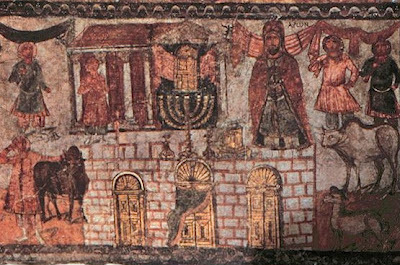 The significance of the 3rd century Dura Europos synagogue murals paradoxically lies less in their historical importance as the earliest example of Jewish narrative art than in their role as a paradigm of what is possible for contemporary Jewish artists. After all, we have absolutely no other examples of Jewish narrative art on this scale and one might argue Dura is simply an aberration, a curiosity from Late Antiquity, never repeated. But of course that is its power, revealing the untapped possibilities of Jewish narrative based on Torah, midrash and individual creativity, spanning a gap of 1700 years and, with imagination, finding parallels and inspiration between their world and ours. The Elijah stories unfold as Continuous Narratives on adjacent southern and western walls showing Divine intercession on behalf of the community and the individual. On the southern wall the duel between the unsuccessful Prophets of Baal and Elijah on Mount Carmel is played out (I Kings 18: 20 – 40). 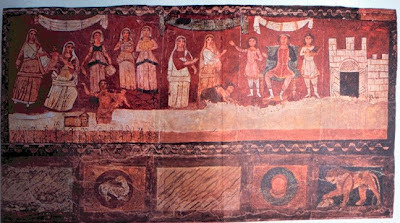 Eight Priests of Baal are clad in Roman togas, surrounding an altar with a sacrifice fruitlessly awaiting their god’s fire. Underneath the altar a diminutive figure hides, attacked by a large snake. This is none other than Hiel, evil general of Ahab, who sought to deceptively light the altar fire, only to be eaten alive by a serpent sent by God, as described in Midrash Exodus 15:15. In the next panel Elijah’s sacrifice is being consumed by a conflagration. Elijah appears at least twice, once summoning the heavenly fire on the left and on the right ordering the sacrifice to be drenched in water to magnify the enormity of the miracle. In the struggle against pagan adversaries and corrupt Jewish leadership God can be counted on to come to our aide yet again. Immediately on the western wall is a depiction of personal salvation, the resuscitation of the widow’s child by Elijah (I Kings 17: 10 -24). Here the child is seen three times; first lifeless in his mother’s arms on the left, then miraculously alive with Elijah in the massive bed in the center and finally in his mother’s arms, happy and well once again. A prominent “Hand of God” supervises the miracle from above on the right side. The triumphant mood of this panel; a Divine reward for a simple-hearted widow perfectly mirrors Elijah’s triumph over the corrupt but powerless pagan priests who attempt to lead the Jewish people astray. As an expression of Jewish disenfranchisement in a pagan society it is certainly notable that this first (lowest) register on the western wall presents a theme dominated by women and converts. Already seen to the right of the Torah niche (Part II – Jewish Press _ July 9, 2010) is Pharaoh’s daughter, a non-Jew who saves Moses and later converts. So too the widow, a non-Jew from Sidon, nourishes the prophet Elijah and then converts. Not to mention the Jews themselves who witness the miracle on Mount Carmel, effectively converting back to their belief in God. And of course anchoring this entire sequence, the Torah niche with the image of the Akeidah features the singular appearance of Sarah at her son’s sacrifice, witness to the event that arguably caused her death. Continuing along the first register to the northern wall, are the narratives of Ezekiel. We see the “Hand of God” no less than five times in this long extended panel, practically at eye level, that fleshes out one of Ezekiel’s most explicit messianic prophecies of national redemption (Ezekiel 37). First we see Ezekiel taken by his hair and placed in the valley of the dry bones. Next he is ordered to prophesy to the bones, here seen as disembodied heads, hands and feet; “you will come to life”. The “Hand of God” commands. Immediately a split mountain is seen littered with a toppled house, body parts and corpses, representing a midrash in Pirkei Rabbi Eliezer 33 that states it took a great earthquake to bring the bones to life. The scene shifts next to an earth-red background and we see Ezekiel again, now standing over three figures about to be resurrected upon the arrival of three butterfly-winged angels that are joining one the ground already hard at work. Another two images of the prophet Ezekiel are seen, now suddenly in anomalous Roman costume. They frame what is the actual subject of the panel, the return of the 10 lost tribes, here as ten men in togas, and the resurrection of the Children of Israel in the time of the Messiah. A singular “Hand of God” of course directs this too. Once we understand the subject and its details, this panel leaps alive in dialogue with the Elijah panels seen on the directly opposite walls. The meaning seems clear; God will resurrect us as a nation and individually in the time to come. 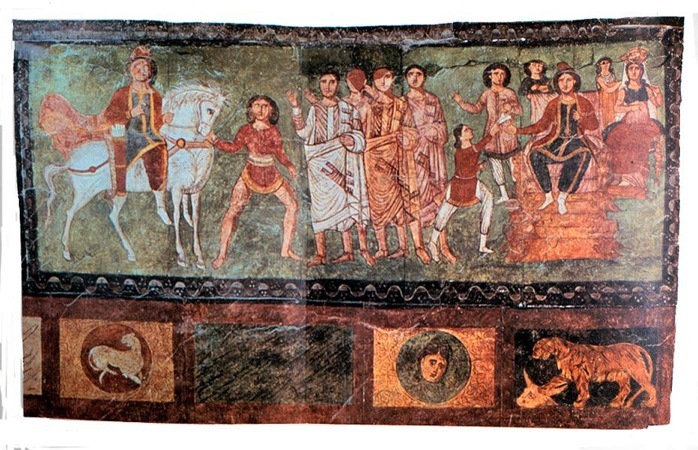 The scholar Jas Elsner (Cultural Resistance and the Visual Image: The Case of Dura Europos: Classical Philology, Vol 96, N. 3 – July 2001) has proposed that one fundamental theme to the Dura murals is something called “Cultural Resistance.” With extensive documentation he shows how much of the Dura images present overt criticism of official Roman cult religion and specifically the pagan religious practices found at Dura. The purpose was to push back against a sea of paganism to help preserve Jewish monotheism and strengthen a threatened ethnic identity. One example of this is found on the second (middle) register of the western wall. 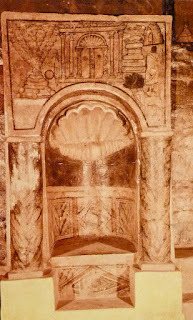 Previously I commented in Part I (Jewish Press - June 25) that the big central panels above the Torah niche (labeled Jacob Blessing his Sons) are much too damaged to be really certain of its subject. Nonetheless, the panels are either side present what I would characterize as a Comparative Narrative. If one consults the plan of the Dura murals seen in Part I, the subjects read, from left to right: The Miraculous Well in the Desert, Consecration of the Tabernacle, Temple of Dagon and The Ark Among the Philistines. Many aspects of these panels invite invidious comparison between Jewish worship and pagan practices. The Miraculous Well mentioned in Numbers 21: 16 – 20 that accompanied the Jews in the desert was in the merit of the righteous Miriam (Taanis 9a). It is seen in the middle of the camp, surrounded by 12 little huts, each with a figure standing in the doorway, hands raised in praise of the life-giving waters being miraculously hosed into each house. Supervising this entire operation is the towering figure of Moses in whose merit the well returned after the death of Miriam (Numbers 20:1). Sharing the central place of honor with the well is the Tabernacle with the golden menorah overseeing the scene. It is a triumphant image demonstrating God’s protection and sustenance for the Children of Israel even after the people bitterly complain against God and Moses at the Waters of Strife (Numbers 20: 13) and the incident of the Fiery Serpents (Numbers 21:6). In spite of complaints and punishments our God does not abandon us. Moving backward in time we see the Consecration of the Tabernacle (Exodus 40: 17 & Numbers 7:1) immediately to the right. While here the desert tabernacle looks more like a permanent Temple, the artist is conflating the biblical text concerning the Tabernacle with the relatively recent reality of a permanent Temple (less than 200 years before). 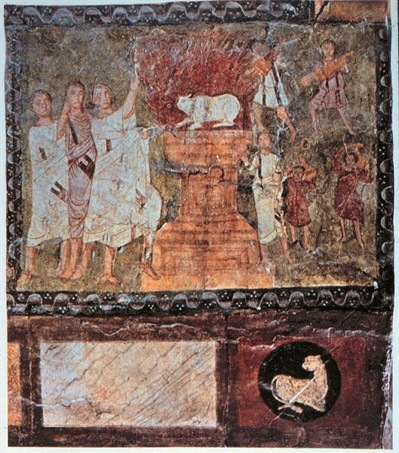 The enormous image of Aaron, identified as such in Greek, perhaps for the benefit of non-Jewish visitors, is presiding over the sacrifices on the right and left. The five figures may very well represent his four sons and an Israelite who is also allowed to perform the sacrificial act of slaughter. The “Tabernacle” contains the aron seen in the doorway with the golden menorah prominently placed before it. This obviously schematic representation of the tabernacle conflates symbolically the temporary desert tabernacle with the permanent Temple alluding to the fervently hoped for final Third Temple. This panel celebrates how Jews consistently worship their God, in the distant past, recently and in the future. In this Comparative Narrative these two panels, the Miraculous Well and Aaron’s Tabernacle are contrasted with the two scenes represented on the right side of the middle register: The Temple of Dagon and the Ark Among the Philistines. The triumphant message could not be clearer. The next image is a grim study in closed doors and rigid hierarchy. The temple is flat, schematic and generic; unlike any other scene at Dura no human being is depicted in this panel. It is identified as non-Jewish by the pagan images on the central door, recognized as well-known Roman gods. There is no life or religiosity possible in this wasteland. Next is the image of the Ark of the Covenant captured in the Temple of Dagon. In the Philistine sanctuary their cultic idols are smashed and the Philistines are rushing to expel the Ark from their midst. This God of the Hebrews is much too hot to handle. Theologically it is a scene of devastation, a pagan apocalypse. For the Dura Jews the message could not be clearer, the pagans don’t have a chance. Dura Europos has a lot to teach us. As artists and appreciators of art the mix of three different narrative styles; Symbolic, Continuous Narrative and Comparative Narrative presents a wonderfully complex assortment of tools to search for and find meaning. This is compounded by the liberating structure of multiple textual sources; the Bible and the midrash commentaries to interact with the artists own point of view. The freedom to actually add the presence of God in the form of “The Hand of God” seems to create the notion that almost anything is possible in this creative environment. Add in an assortment of different costumes, figures seen in different scale and perspective motifs and we end up with a kind of visual cornucopia that feels increasingly post-Modern in its eclecticism. Indeed, Dura stands as the earliest example of Jewish narrative art; perhaps only now, so many years later, ready to take its place as the rich foundation upon which a complex, creative Jewish narrative art will grow in the years to come. Looking at Dura we are on the cusp of the future. N.B. I am deeply indebted to many of the scholars referenced in this review, especially Gabrielle Sed-Rajna’s work Ancient Jewish Art (1985) Chartwell Books, NJ and the images found therein.